Steve Howell: Avid sports fan and baseball enthusiast and the IN show's in-house entrepreneurial expert! Hollywood - Steve Howell, avid sports fan and baseball enthusiast, joins the IN show to help us celebrate the life, career and legacy of Roberto Clemente. 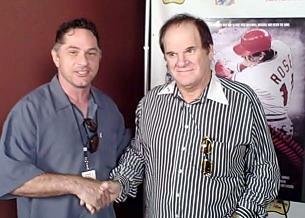 Steve Howell (l) with Pete Rose (r). Hollywood - Now, more than ever before, Americans are finding it necessary to reassess their options in an ever shrinking job market. Steve shares with us what we can do, how we can respond, and where we can find hope to revive the American Dream. is building his business with Varolo Time. this worthwhile opportunity with you.